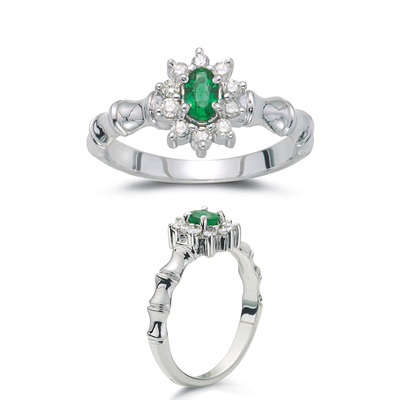 0.22 Cts Diamond & 0.16 Cts Natural Emerald Ring in 14K White Gold . This is a gorgeous flower ring with a 5x3 oval Natural Emerald in the center surrounded by ten diamonds in 14K White Gold. Approximate Gemstone Weight: 0.16 Carats. Approximate Diamond Weight: 0.22 Carats. The band has a bamboo look part way.